Okay, so what is cuter than toddler pajamas ... gracious, not a whole lot comes to mind? 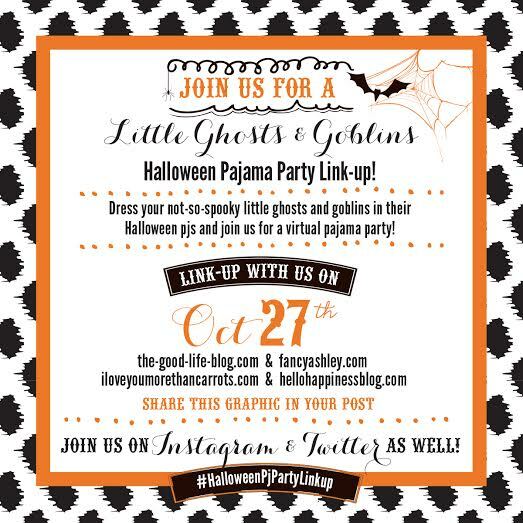 I was so excited to join the Little Ghosts and Goblins pajama party linkup this year with my sweet Camille and her skeleton pajamas! She points to them and says "BOH" for bones. Melt my Halloween-loving heart. I bought these jammies from a girlfriend who no longer needed them. They are from Old Navy. And did I mention that the bones, or BOH, glow in the dark? I did hook my little girlfriend up with a small bow before the next photos. We don't sleep in bows, obviously, but her bangs are so long nowadays and I didn't want them to tickle her for the photos. Added bonus, extra sweet cuteness. This last image is what I get to see every night. She is so opinionated these days on what we read! And, most nights, I am able to decipher whether her urgent request for "MOWH" means "moo" (Noisy Farm), "meow" (What A Good Kitty), or "mouse" (Just A Kite). Thank you to the hostesses for letting me show off my very favorite skeleton. I can't wait to see the rest of the cute kids! If you linked up, let me know in the comments so I can visit your blog! SO CUTE!!! I cannot get enough baby/toddler holiday pajamas! My husband thinks I'm crazy, but come on! You can never have too many. Oh so sweet! I feel the holidays are so special with a little one to celebrate with! She is just way too cute! Her little personality in those pics is too much!! Loved seeing Camille in her Halloween jammies!! Love those jammies...do they make them in adult sizes? And Camille has the absolute best facial expressions in photos. I just love her! Such a big personality! Camille is so stinkin' cute! Love her adorable PJ's! Those PJs are just darling! And Camille makes them even cuter! Isn't Halloween just the best? Oh my goodness, Camille could not be any cuter in those Pj's and bow!! Oh my cuteness, those pajamas are adorable! !